This GMC Sierra 2500HD delivers a Gas/Ethanol V8 6.0L/366 engine powering this Automatic transmission. WORK TRUCK PREFERRED EQUIPMENT GROUP Includes Standard Equipment, WHEELS, 17" (43.2 CM) STEEL includes 17" x 7.5" (43.2 cm x 19.1 cm) steel spare wheel. (STD), TRANSMISSION, 6-SPEED AUTOMATIC, HEAVY-DUTY, ELECTRONICALLY CONTROLLED with overdrive and tow/haul mode. Includes Cruise Grade Braking and Powertrain Grade Braking (STD). 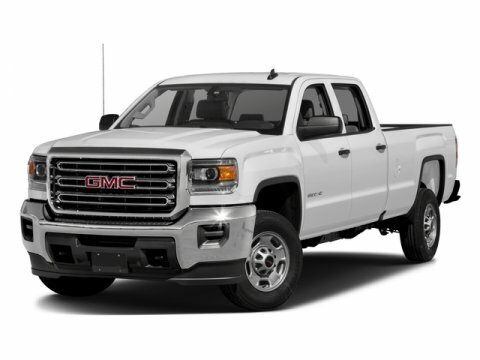 * This GMC Sierra 2500HD Features the Following Options *SUSPENSION PACKAGE, HANDLING/TRAILERING, HEAVY-DUTY includes 51mm twin tube shock absorbers and 33mm front stabilizer bar (STD) , TIRES, LT245/75R17E ALL-SEASON, BLACKWALL (STD), SUMMIT WHITE, SEATS, FRONT 40/20/40 SPLIT-BENCH, 3-PASSENGER, DRIVER AND FRONT PASSENGER RECLINE with outboard head restraints and center fold-down armrest with storage. Vinyl has fixed lumbar and cloth has manually adjustable driver lumbar. (STD), REAR AXLE, 4.10 RATIO, PAINT, SOLID, JET BLACK/DARK ASH, CLOTH SEAT TRIM, GVWR, 9500 LBS. (4309 KG) (STD), ENGINE, VORTEC 6.0L VARIABLE VALVE TIMING V8 SFI E85-COMPATIBLE, FLEXFUEL capable of running on unleaded or up to 85% ethanol (360 hp [268.4 kW] @ 5400 rpm, 380 lb-ft of torque [515.0 N-m] @ 4200 rpm (STD), AUDIO SYSTEM, 4.2" DIAGONAL COLOR DISPLAY, AM/FM STEREO with USB port and auxiliary jack (STD). * Stop By Today *Test drive this must-see, must-drive, must-own beauty today at Bleecker Buick GMC, 926 E 4Th Ave, Red Springs, NC 28377.